In 1963 John Cage arranged the first performance of Eric Satie's circuitous Vexations at the Pocket Theatre in New York, a performance that lasted sixteen hours and forty minutes. Inspired by Cage's example Cambridge University's Sidney Sussex College Music Society mounted their own performance of Vexations in 2007. The college's Senior Organ Scholar Jamal Sutton was one of the pianists for the Sidney Sussex performance. Jamal Sutton is organist on the outstanding new CD of music by Thomas Tomkins seen above, which also features the Choir of Sidney Sussex College, vocal ensemble Alamire and the viol consort Fretwork directed by David Skinner. 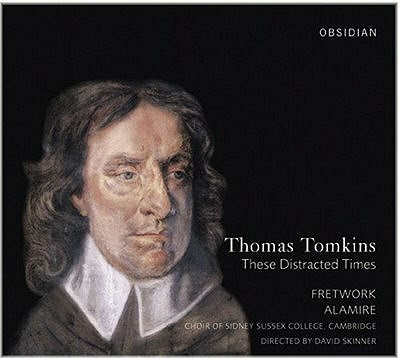 The CD is titled These Distracted Times as it includes a Pavan by Tomkins with that sub-title written immediately after the execution of Charles 1 in 1649. Following the king's execution Oliver Cromwell established his Commonwealth with himself as Lord Protector. Cromwell, who was a graduate of Sidney Sussex College, also fell victim to These Distracted Times. He died of natural causes in 1658 and was buried with great pomp in Westminster Abbey. But following the restoration of the monarchy in 1669 Cromwell's body was exhumed and posthumously executed. His severed head passed through a number of owners before being buried in the grounds of Sidney Sussex College in 1960, close to the chapel where These Distracted Times was recorded. Cromwell features, with head in situ, on the artwork of the CD. It is released on the new Obsidian label which specialises in early music. Anyone doubting the wisdom of launching a new specialist classical label in These Distracted Times of 2008 should remember John Cage's words -'Maybe there is a link between poverty and music'.